TONES ONE exports to Bangkok a new updated version of his last project in Asia titled "Permanent Spraycation*. This solo show presents a travel diary - combining paintings, photos and videos- recounting the artistic peregrinations of the Swiss/Khmer graffiti writer in the most crazy and absurd corners of South Asia, from Delhi, Varanasi, Kolkata to Bangkok and Phnom Penh. With just a sketchbook, a camera and plenty of stupendous ideas in mind, the Swiss/Khmer artist has traveled in the Indian subcontinent where he got stunned by an explosion of various colors and textures. With an admittedly limited equipment but a wide range of pigments of vibrant colors, TONES ONE walked the streets of Indian mega-cities in search of differently textured walls to paint great murals and meet the locals. His journey continued across Southeast Asia all the way down to Cambodia, his Motherland, where incredible encounters and stories have continued to support the realization of his energetic and vivid artwork combining lettering and graphic illustration. Presented exclusively in Bangkok, in the form of a graffiti/travel diary, "Permanent Spraycation" retraces 6 months of travels and anecdotes of local graffiti milieu between 2014 and early 2015. With this exhibition, TONES ONE shows us another way to travel and apprehend graffiti. 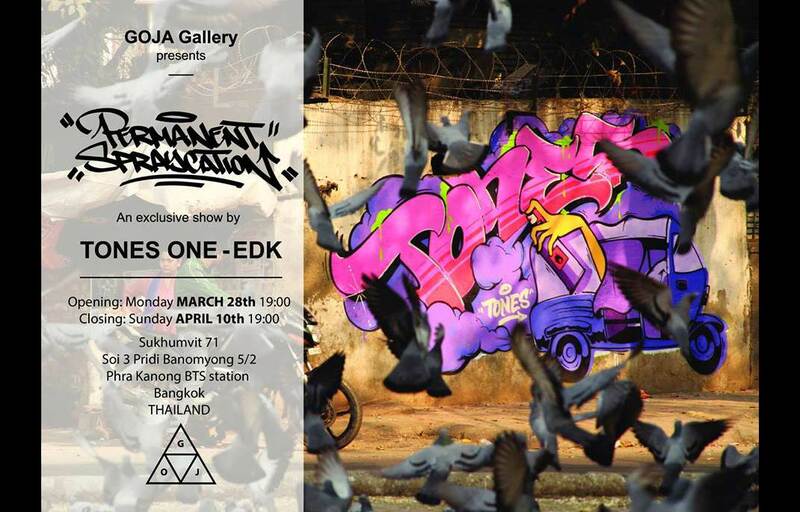 The exhibition will take place at GOJA Gallery Café, Bangkok from March 28th to April 19th.